In 1724, Philip V retired to this town – to the farm formerly owned by the Hieronymite monks of El Parral Abbey – and spent the next two decades enlarging the gardens and palace, subsequently used as a summer residence by all his successors until Alfonso XIII. Opening times October to March: weekdays, weekends and holidays 10:00 to 18:00. April to September: weekdays, weekends and holidays 10:00 to 20:00. Royal Palace (€9.00), Tapestry Museum (€5.00). Free entry for the under 5s. 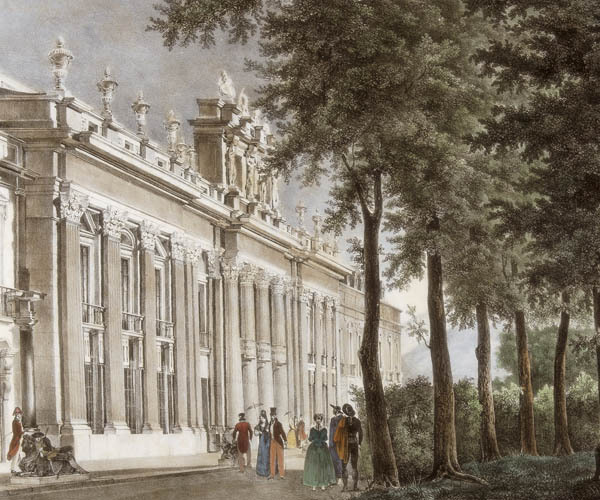 Work began in 1721, inspired by the complex of the Palace of Versailles. The project for the extensive gardens was the work of the French architect and landscape artist René Carlier. 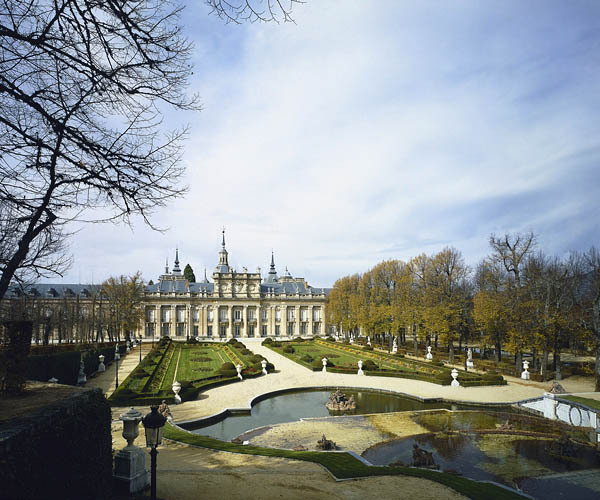 When Carlier died in 1722, the then gardener of the Real Sitio de Aranjuez, Étienne Boutelou, took charge of the works. He was assisted by other landscape gardeners and could avail of the output of a sculpture workshop staffed by the sculptors René Frémin, Jean Thierry, Pierre Pitué, Jacques Bousseau and the brothers Antoine and Hubert Dumandré. 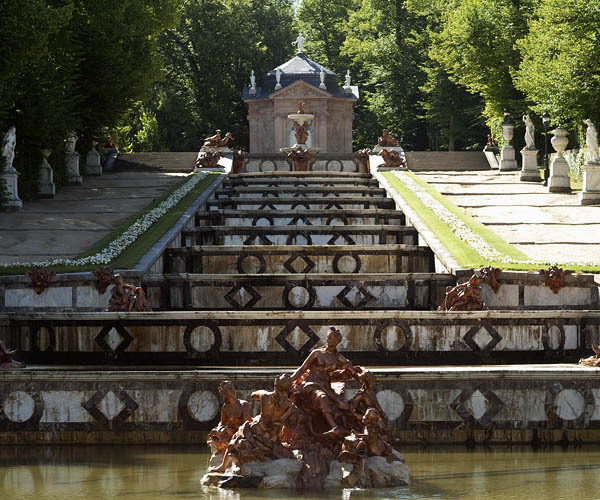 The extensive gardens were designed as a series of courtyards, open spaces, ponds, waterfalls and fountains adorned with mostly mythological and allegorical sculptures and sculptural groups. Particularly noteworthy are the Esplanade, the Forest Fountain, the Horseracing Circuit, the New Waterfall with its Fountain of the Three Graces, the Fountain of the Eight Roads, the Latona and Canistillo Fountains, the Fountain of Diana Bathing and the Fountain of Fame. The construction of the Royal Palace began in 1721, when the architect Teodoro Ardemans took charge of renovating the old hospital, converting it into a summer palace with a chapel attached. Completed two years later, the Royal Palace has a rectangular floor plan around a central courtyard with corner towers. 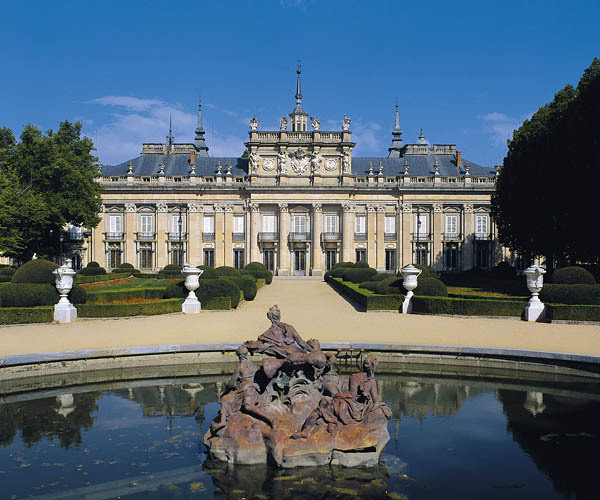 Felipe V subsequently expanded the building further due to Elizabeth Farnese’s interest in establishing the Court in La Granja de San Ildefonso. The Italian architects Andrea Procaccini and Sempronio Subisati were responsible for the design of the Carriage Courtyard and the Horseshoe Courtyard, which were, in fact, designed as the rear and front facades of the Royal Palace. The different coloured materials used in the building make for a harmonious composition: pink stone for the walls, granite for the pilasters and corners and slate for the roofs.The Horseshoe Courtyard, which contains the main facade of the palace, is an open U-shaped space. The Carriage Courtyard has a similar layout but is more austere. A square pavilion forming part of one arm of this courtyard is distributed around three smaller patios lined with servants’ quarters, general storerooms, furniture and tapestry rooms and a pharmacy. The most sumptuous facade is that looking onto the gardens. Designed by Filippo Juvara it was built by Juan Bautista Sacchetti between 1736 and 1741. The front features giant Corinthian-order pilasters, except in the corps de logis, where the columns are half-columns. The facade is crowned by a balustrade and a rectangular attic, with four caryatids in marble – allegories of the four seasons – supporting the upper entablature, adorned, in turn, with another balustrade, military trophies, a crowned Order of the Golden Fleece and medallion sculptures of the founding kings of this Royal Site. The Royal Palace inside is laid out around the Fountain Courtyard – the cloister of the former hospital and the focal point of the building constructed by Ardemans. Rooms are distributed between a ground floor and a first floor. On the ground floor the most notable rooms are the Gallery of Statues, the Marble Hall, the Conciergerie, the dining room, the guard room, the stewardship room and the telegraph room. Upstairs, we find the Official Gallery, the Throne Room and the Japanese Room amongst others. 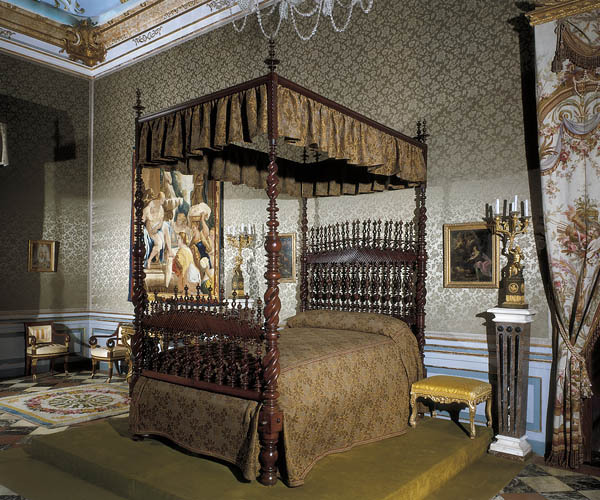 The Royal Palace has collections of 18th- and 19th-century paintings (some 300), including works by Houasse, Van Loo and Luca Giordano, and around 100 sculptures and items of furniture in the Empire, Regency, Louis XIV and Louis XV styles, not to mention its renowned Museum of Tapestries. The Collegiate Church of the Holy Trinity has a Latin-cross floor plan, with walls that alternate straight and ondulating lines. Two towers terminate in spires and a dome rises over the crossing. The interior is decorated with carved medallions and bas-reliefs. Unfortunately, the frescoes by Bayeu and Maella that decorated the domes and vaults have been lost. The Hall of the Pantheon contains the funerary monument of Philip V and Elizabeth Farnese (1756). Other buildings are the Barracks (1762-1765), the Casa de los Oficios (accommodation for the Court), the Royal Stables and a Glass Museum (created in 1990) housed in the former Royal Glass Factory located near the Palace.